THIS portion of our studies must be gone through in strict accordance with the rules we have laid down in our first paper. “Keep your temper,” and “Play fairly,” are two phrases which must never be forgotten throughout this exercise. which is to be performed as follows :—Raise your single-stick until the hilt is just below the chin, the stick perpendicular, edge to the left, your thumb extended on the side of the handle, your elbow close to your body; your left pendent upon the left side. See Fig. 1, and the directions for “Recover Swords,” at p. 101. Next raise your left arm as high as your shoulder, and bring your hand round by a circular motion over your eyes, your knuckles uppermost, and your fingers extended; at the same time you lower your weapon and your right arm to its full extent, to the right, the edge of the sword falling towards the left, your right elbow close to your side. (See Fig. 2.) After neatly and gracefully making the salute, step towards your opponent, and proceed to “Prove Distance.” (See p. 102.) If you have taken up a proper distance, the point of each stick should touch the guard of the other. Throughout this engagement there must be no flinching or jumping about; protection against each cut must be obtained by the stick, and not by the inglorious use of the legs—in jumping backwards or upon one side. At the same time, it must be borne in mind that every cut is to be given so lightly, that if it be not warded off by the proper guard, and is thus enabled to fall upon the body, it cannot hurt. This combat is to be renewed until both adversaries are perfect in every cut and guard. Join sticks upon the outside guard. Both.—Resume the position of “Guard,” and afterwards that of “Slope Swords.” Repeat the combat till perfect. This combat to be repeated several times. Join sticks, and form guards as explained in first combat. We have now gone through the whole of the Broadsword and Single-Stick Exercises; but before taking leave of our subject we wish to make a few observations either general, or as further illustrating some of the more difficult portions of the study we have been going through with our pupils. The proper execution of the Cuts and Guards lies at the foundation of all good Single-Stick or Broadsword play. If the cuts are not given in the proper direction, if the guards are not formed precisely after the manner shown upon the target delineated at p.100, none of our pupils need expect to become formidable against an adversary, or secure against scientific attack. 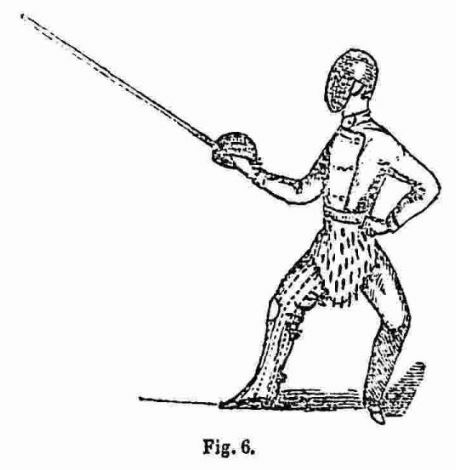 It being our object to smooth away every difficulty, to anticipate every obstacle, that may arise in our series of “Manly Exercises,” we have gone carefully through the three parts of the Broadsword Exercises already published, with the view of endeavouring to find out anything that might appear obscure or insufficiently explained. The motions, positions, construction of the target, and the rules for the selection of weapons, we find require no further comment; but as the execution of the cuts and guards needs such careful study, we think it advisable to add a few remarks, additional and explanatory, to those already furnished at p. 101. At the order “Cut One,” you make a stroke diagonally through the target; the cut commencing at that point marked 1 in our illustration [of the target] given at p. 100, and coming out at 4. When the point of the stick has cleared the target, you, by a turn of the wrist, bring the weapon up to the left shoulder, with that part of it tuned the edge towards the left. At the order “Cut Two,” proceed as in the foregoing manner, but commence at 2 and terminate at 3. At the finish of the cut, the wrist should he a few inches outside and below the right hip. At the order “Cut Three,” cut upwards, diagonally, beginning at point 3 and terminating at point 2. At the order “Cut Four,” cut upwards, diagonally, commencing at point 4 and terminating at point 1. At the order “Cut Five,” cut horizontally through the target, from right to left, beginning at point 5 and concluding at point 6. At the order “Cut Six,” cut horizontally through the target, from left to right, commencing at point 6 and terminating at point 5. After the cut, continue the sweep of the single-stick until you bring the hilt above your head; the edge of the stick upwards, the point hanging over the back. At the order “Cut Seven,” execute, from the preceding position, a downward stroke, vertically, from point 7 to the centre of the target. The positions of the guards require no explanation further than those already given: in making an enlarged copy of the target we have supplied, it must, however, be remembered that no deviation in the directions of the guard can be allowed. 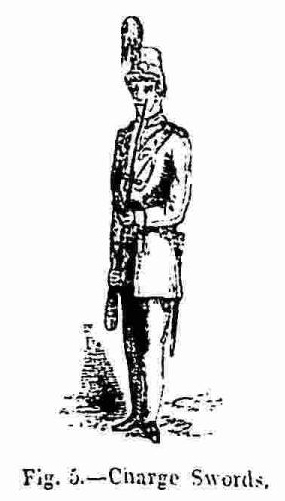 As in the words of command given for the Rifle Exercises in our last volume, it is necessary to remember that the first portion of the word is cautionary only; and that no movement is to be made until the last syllable is given. The bayoneteer also comes to the position of “Guard,” which is performed thus: In the first instance, fall into the attitude termed “Charge Swords” in the Rifle Exercises. (See the directions and illustration given at p. 364, vol. vi., of the BOY’S OWN MAGAZINE [Editor’s note: this image has been added to the right].) In the next place, lower the right wrist upon the upper part of the right hip, and at the same time bring the left elbow close to, and in front of, the body. In that position the broomstick will be grasped with the right hand within about six inches of its end, while with the left hand it will be seized about the middle of its entire length. The broomstick should be held in a horizontal position, with its point directed towards the height of the swordsman’s breast. 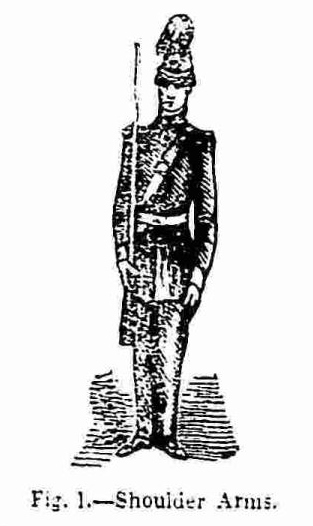 Bayoneteer.—Come to “Shoulder Arms.” (See directions and illustration given at p. 362, vol. vi., BOY’S OWN MAGAZINE [Editor’s note: this image has been added below to the left]). In the preceding mimic encounter the swordsman has achieved the victory; for he has obtained possession of his opponent’s weapon, and has brought his own into play, ready to give “Cut Six” at his adversary; which, cut, being a horizontal one, and directed at the throat, might, were the swordsman armed with a sharp weapon, and had he strength, determination, and skill enough, cut off bayoneteer’s head at one blow. Bayoneteer must, however, be done justice to, and accordingly we will explain how he may defend himself against the above unpleasant termination. The whole of the above exercise is to be gone through precisely as already explained; but when swordsman brings forward his left hand to grasp the broomstick, bayoneteer foils him by assuming the position termed “Shorten Arms,” which is performed in this way: The right arm is thrown back to its full extent, the left arm also being carried back—both hands still retaining the hold upon the weapon, which, in consequence of the movement thus made, is brought backward in a horizontal position across the upper part of the chest, until not more than a fourth of its length projects beyond the bayoneteer’s left shoulder, and is, in consequence, quite out of reach of the swordsman. In conclusion, we must again impress upon our pupils the necessity for always making use of the mask in these exercises. One of the best draughtsmen of the present day, who is also a very fine swordsman, lost the sight of one of his eyes through neglect of this necessary precaution. We are only acquainted with two modern treatises upon the broadsword. These lessons constitute the third work upon the subject; and we feel a certain amount of satisfaction, and are egotistical enough withal, to state that our work is the only one that could be placed in the hands of boys. We will explain how this is. The first work is solely for use in her Majesty’s Army. In it, swords, bayonets, and an elaborate and complicated system of drill are employed; consequently it would be as useless as dangerous to our pupils. Work number two is founded upon the military manual, and is dangerous, useless, and moreover absurd, for it employs the sword instead of the single-stick; and, among other mistakes, contrives upon one occasion to get the swordsmen in position one exactly behind the other; after which it proceeds to give a long series of cuts and guards, which are all very nice for the person in the rear, because he has an opponent turned with his face, hands, and weapon completely away from him; but as for the unfortunate individual in front—he can only “cut and guard” at the air in return for the castigation he is receiving from his adversary behind his back. Work number three is our own. 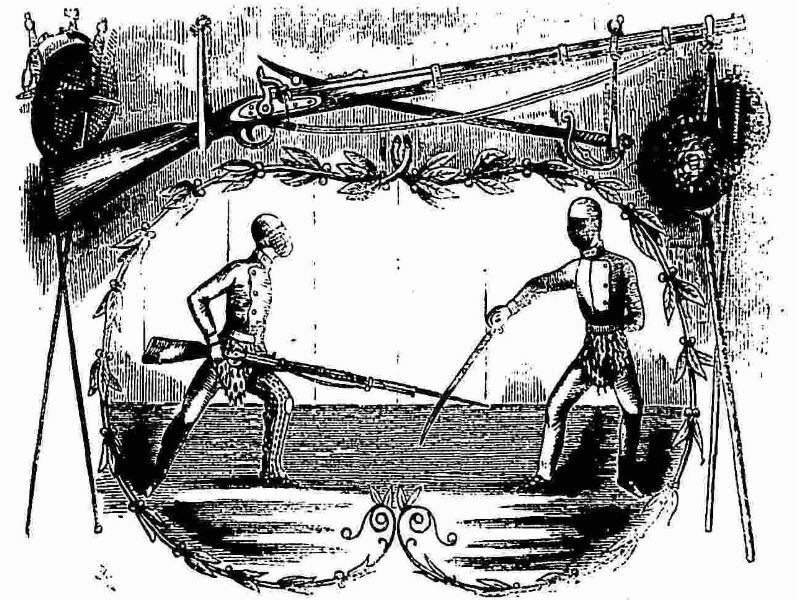 It is founded upon the system in use in the British Army; but, by being cleared of complications, unnecessary drilling, and by recommending the use of harmless weapons, it constitutes the art of Broadsword at once safe, certain, and valuable as a “Manly Exercise” for those who wish to become skilful, graceful, and strong men, without paying the penalty of losing an eye, or having the muscles of their arms divided, for these same advantages. Here ends this series. More vintage articles on self-defense can be accessed on our Resources page. « What is Classical Fencing? No, I mean really?